I’ve been at home under my duvet all week; tissues in one hand, mug of Lemsip in the other. When I get a cold, it’s a pretty sorry affair. I can really make an art of wallowing in self-pity. And now we’re at that inevitable stage in the virus’ evolution where my asthma cough kicks in good and proper. Long, frustrating nights during which a dispassionate observer would swear I was attempting to expel my lungs from my body. Great. Anyway, as well as watching about twenty episodes of The Good Wife (so addictive; loving Christine Baranski), my thoughts have turned to happier times and sunnier climes. Deluding myself that this is a more productive use of my time, I’ve been slowly writing this post over the last three days, in between my hateful expulsions and regular naps. I present to you: Souvlaki and Sunsets. I think I first became aware of Santorini by virtue of an article in the Guardian on the topic of things you should see before you die. 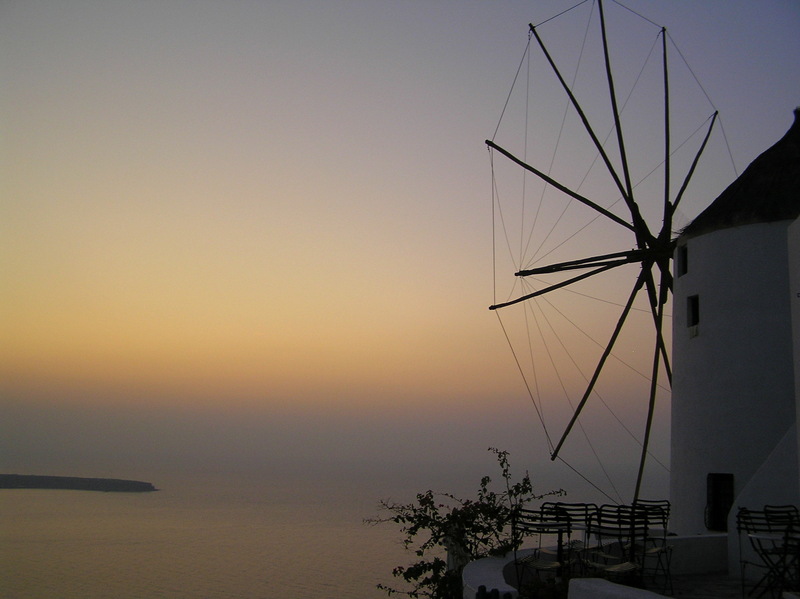 The journalist was specifically talking about the view of the sun setting over the volcanic caldera from the little whitewashed town of Oia on the island’s northernmost tip. The image stuck with me and so when Paul and I were choosing our first holiday together in the early autumn of 2008, I was quick to suggest the little Greek haven. 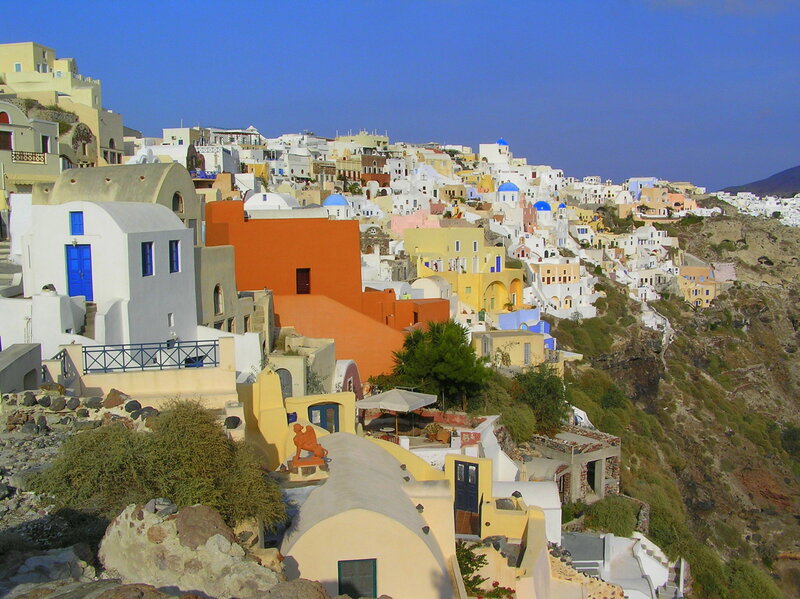 Santorini (or Thira, to use its official name) is part of the Cyclades group of islands and was formed by a mighty volcanic eruption some three thousand years ago. Classical scholars consider this eruption the source of the Atlantis myth, submerging as it did the land for far around. It is also – more factually – understood to be the cause of the collapse of the Minoan civilisation. The aforementioned caldera is now a large lagoon, about 12km long and surrounded by high cliffs. The island still suffers from seismic activity, with half of its buildings completely destroyed by earthquakes in 1956. Most of the population had to evacuate to Piraeus and Athens and many never returned. We stayed in Phira, the island’s main town. It’s a visually arresting place with the buildings dug into pumice stone and painted a variety of colours of volcanic ash. The town has a pretty Catholic quarter and precipitous cliff-top paths with views over the Aegean Sea, along which Paul nervously tried to prevent me getting too close to the edge. Despite its beauty, however, we found the town disappointingly touristy, with the typical beachwear shops and souvenir tat, so didn’t hang out there much during the day. On an evening though, it was a different story, with its peaceful streets, twinkling coastal lights and good range of seafood restaurants. We spent happy days pottering around and swimming in the hotel pool, and one afternoon tried braving a deserted beach. The end-of-season temperatures of both air and sea were somewhat off-putting. A boat trip to the centre of the caldera was more successful, with an enjoyable romp over the rocky, black moonscape. The island is also home to a small but successful wine industry, based on the indigenous grape variety – Assyrtiko – and we sought out a winery to have a taste. 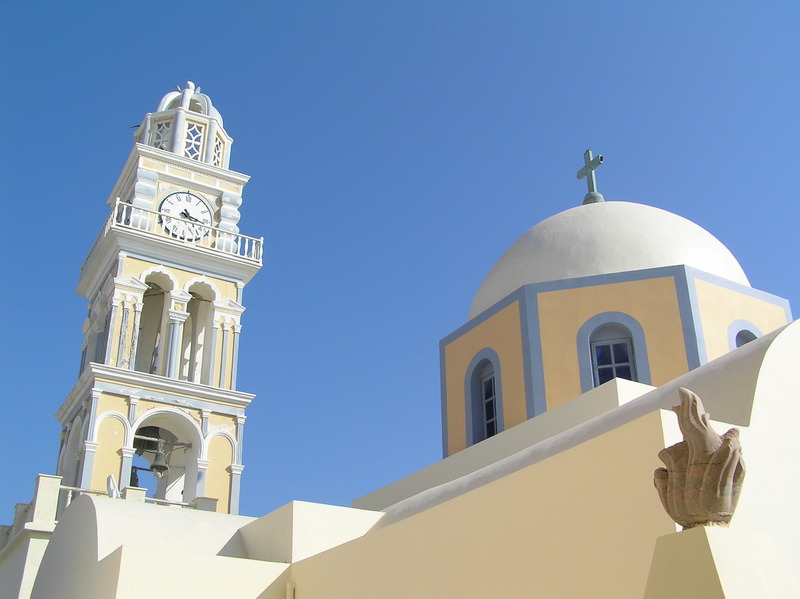 But the hack was right: the reason to come to the island is for the utterly charming village of Oia (pronouced Ee-a). The unique style of architecture, quaint windmills, bell towers, white homes, blue roofs, sheer cliffs and panoramic views of the caldera are stunningly beautiful. An ideal place to stroll around; we spent our time nipping into chic art galleries and musty bookshops, sipping cocktails from terraces overlooking the shimmering blue sea, and eating in some fabulous restaurants. I’d particularly recommend Pelekanos, where the Greek and Mediterranean dishes are delicious and the terrace affords great sunset views. 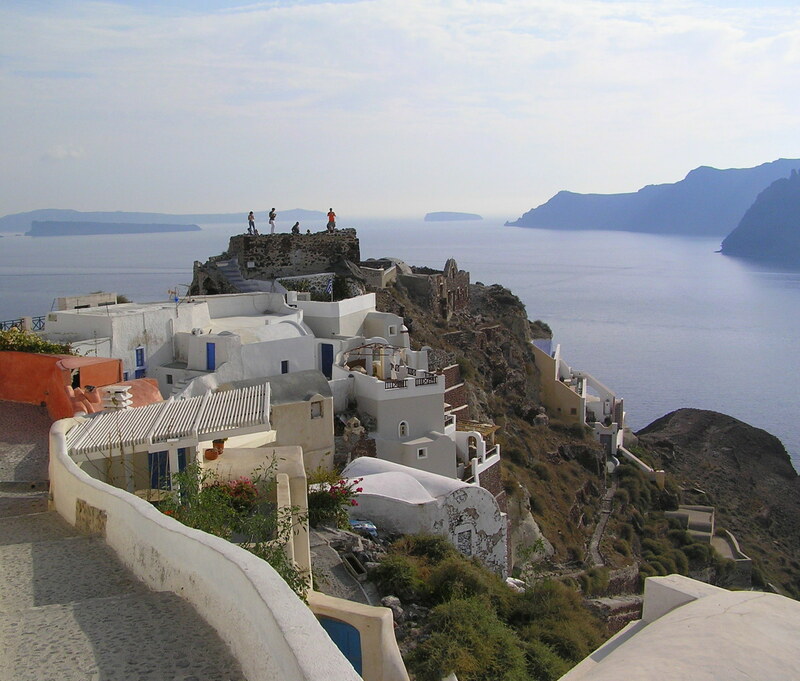 If I ever returned to the island, I would definitely choose to stay in Oia, but I’d combine the trip with another Greek island or a short stay in Athens. A week there was probably longer than was needed…at least for the time of year. And that is that. A combination of my poor memory and my distracting cough prevents me from writing more. I hope you are all feeling well and enjoying the last of the summer sun! 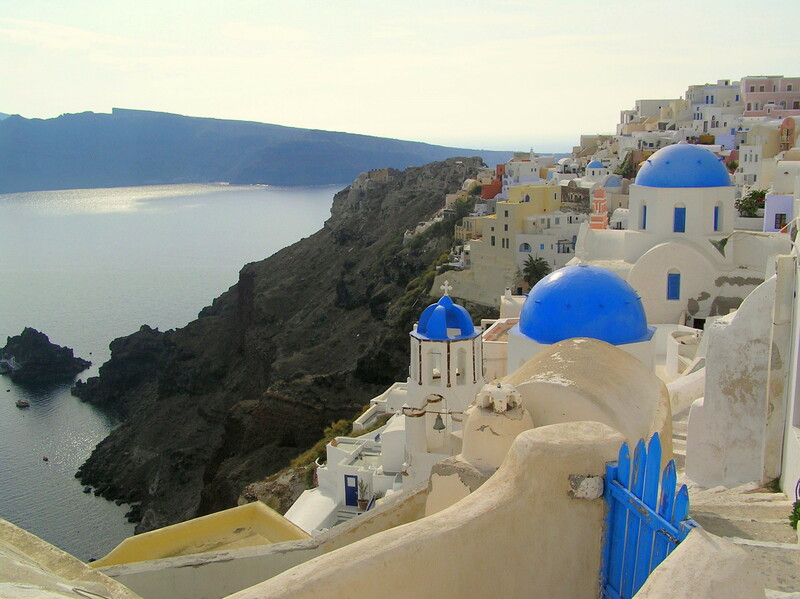 This entry was posted in Travel and tagged Oia, Phira, Santorini on September 25, 2014 by victoriassecretblog.